One of my favorite finds at BlogHer ’12 was Late July Organic Snack Chips! They are a regular staple in our house now and I would much rather buy Late July than the alternative. They are made with organic ingredients (USDA certified), gluten-free, and a strong proponent of the GMO labeling project! The flavors are D-E-L-C-I-O-U-S and taste great by themselves or with your favorite salsas, cheese dip, guacamole, or taco dip. My kids love them so much that I usually pack a small bag of Late July in their lunch for an eco-friendly lunch box. 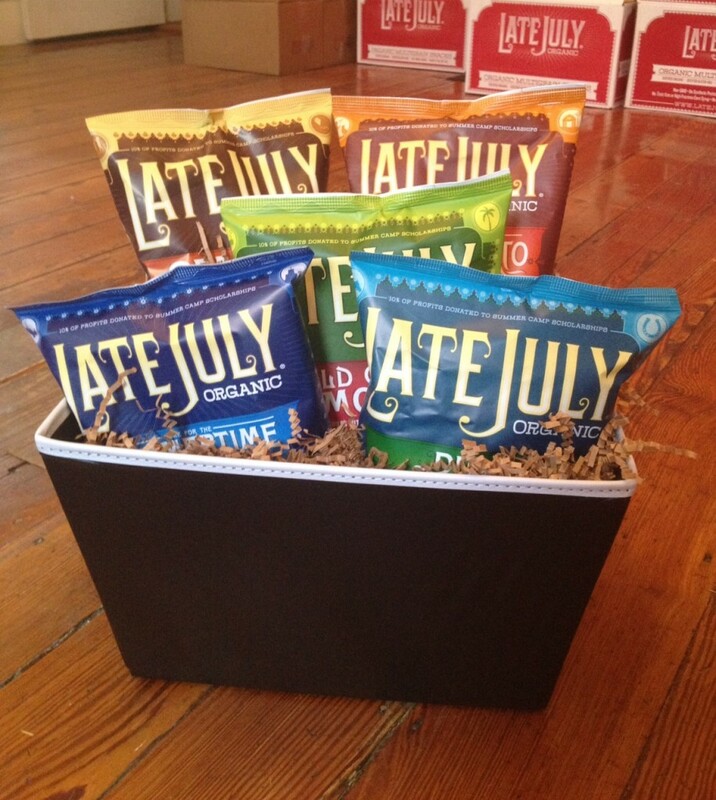 Would you like to win a basket full of Late July Organic Snacks? Disclosure: I received samples of Late July Organic Snacks free for my review. The opinions expressed in this post are my honest opinions and not influenced by the sponsor. These sounds good! Where can i purchase them at? I’m in FL and found them at Publix and even found them once at Marshall’s. The sea salt tortilla chips. Mmmmm. Mild Green Mojo chips with some homemade guacamole! Sea salt tortilla chips – yummy with homemade salsa! I’ve never seen those. I would love to try them! Toni Lardizabal Keltner recently posted..Flufftastic Giveways Ending Soon… Get Entered, Mommas! I love the peanut butter sandwich crackers! I’d love to try the mini peanut butter sandwich crackers. I like their sea salt tortilla chips. I’m supposed to choose only one?!?! I’d love to try the ranch, sea salt and the mojo! tree recently posted..Canning Burn Update. I think the Mild Green Mojo snack chips sound great. The cheddar cheese bite size sandwich crackers would probably be a big hit with my daughter. We love Late July snacks… my girls like the peanut butter and I like the Ranch & Sea Salt chips! Thanks for the giveaway! The sweet potato look great. I’d love to try the Sweet Potato or Mild Green Mojo! I didn’t know they had so many products! I’d pick the cheddar cheese sandwich crackers. I went to the Late July site, but I already knew the answer – the Mild Green Mojo chips are my favorite!